During the Pledge Music campaign to launch our first album, A Fate Worse Than Life, I had to create an illustration for each of the thirteen songs. These illustrations along with the lyrics to the songs formed the basis of the book we published to accompany the album and I also had to paint one off originals inspired by the songs for pledgers. Looking back I can see this is where I really started to use art as an outlet for my obsession with this, my favourite time of the year and now, every chance I get, every spare half hour or so, I spend working on new illustrations and paintings depicting everything from haunted pumpkin patches to misunderstood creatures of the night. My wife, Jo asked me today if I remember when my love for Hallowe’en became the obsession it is today and I told her it’s always been this way, there’s never been a time that it’s been any different. You see, it’s more than just liking horror films and books and the glow of a well carved pumpkin, it’s about family and all the memories I carry with me from all the Hallowe’ens of yesterday. This is a feast that was well and truly celebrated in our house when we were growing up. We all got into the spirit of it (I make no apologies for that great pun) and the whole week running up to it was the most exciting of all. My sister, Kate and I used to transform our big bumper colouring books, you know the big thick ones, into spell books and we’d pretend to be a witch and wizard who were mortal enemies and have epic battles. We made a broom out of twigs tied to a big stick and magic wands and we even had something resembling a cauldron in which we stirred up a concoction of dirty water and leaves or in our minds, magic potion. I drew pictures of Frankenstein’s monster and Dracula and loved the Charlie Brown special, The Great Pumpkin and the animated version of The Legend of Sleepy Hollow. 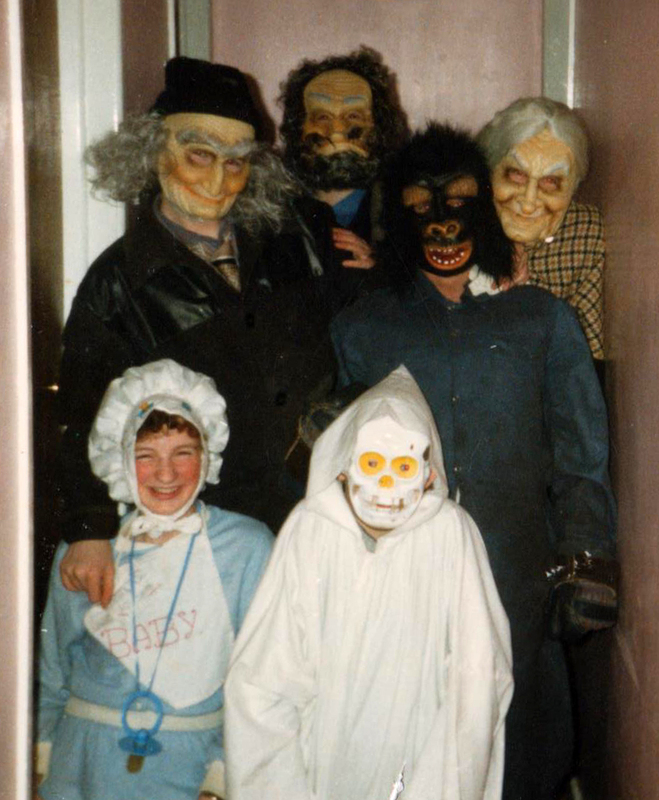 On Hallowe’en night we donned our masks and marched off to the local bonfire where one of the main organisers, Mrs. Kelly gave us crisps and drinks and a toffee apple. Great times. This was usually followed by a game of hide and seek with a cast of thousands or so it seemed. As we got a bit older we dressed up and went to whatever fancy dress party was going. Our house would be pure chaos as we sorted through old clothes to come up with a suitably horrific costume. My mother’s head was tortured as she had to sew us into these magnificent creations just to see us come home later with them almost certainly ripped to shreds. She loved it though. She and my Dad always had a good laugh at the state of us and they still do. Nothing we do now surprises them, they’ve seen it all. They’re as bad themselves anyway, do anything for a laugh, we didn’t lick it off the grass. My uncle Paddy used to tell us ghost stories and let me tell you, he was good! He had us terrified because most of his stories were of the local area. I vividly remember walking from his house one Hallowe’en night, after he had put the chills up us, in a low, thick fog. I couldn’t see, the fog was illuminated by the moonlight, making it impossible to see a thing. Perfect haunting conditions! I remember being so scared walking home, feeling around with my foot to make sure I wasn’t about to stray off the lane and into the fields but at the same time loving it. I’ve never lost that memory or that feeling. It’s all those memories and a whole lot more that keeps me tied to the 31st Oct. Hallowe’en is Autumn. It’s leaves blowing in the wind, it’s ghost stories, it’s friends, monsters, witches and devils, it’s old Ireland but most of all it’s family, my family, laughing and playing together. 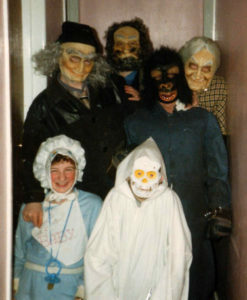 The photo shows some of my family and friends ready to descend on a fancy dress ball, the little skeleton ghost is me. This is the outfit I was wearing as I tried to make it home through the fog, now if that’s not a Hallowe’en image I don’t know what is. Maybe that’s what I’ve been trying to recreate ever since.